Two-dimensional (2D) materials are materials consisting of only a single or a few layers of atoms. Owing to their unique topological structure, 2D materials often possess exotic physical properties, which brings about a range of revolutionary applications ranging from novel electronic devices, sensors to atomically-thin lubricants [1-4]. Because 2D materials are ultra-thin, with a highest surface-to-volume ratio one can ever obtain, their properties and performances are easily susceptible to the surrounding environment. How these atomically-thin sheets interact with neighboring materials through contact interfaces, and how they behave differently compared to their three-dimensional (3D) counterparts (Figure 1), have become an interesting subject for mechanicans, material scientists and tribologists. Mechanical properties of 2D materials have been under extensive exploration and significant progress has been made over the past decade [5-7]. For example, you can find a very nice review article in Extreme Mechanics Letters contributed by several active members of iMechanica . In our jclub forum, a few topics related to adhesion (http://imechanica.org/node/14276), strength and deformation mechanisms (http://imechanica.org/node/17999), buckling (http://imechanica.org/node/20857) and overall mechanical properties (http://imechanica.org/node/19915) of 2D solids have been discussed by Profs. Rui Huang, Shulin Zhang, Yong Ni and Harold Park. In this journal club, I would like to add to these excellent discussions and share some recent advances in frictional behavior of 2D materials. Particularly, I will focus on a few aspects related to surface friction of 2D materials (not interlayer sliding) and try to illustrate how 2D materials offer a unique playground for exploring the mechanics of friction. In contrast to the 3D counterparts, friction on 2D materials shows an unusual dependence on sample thickness: thinner samples with fewer atomic layers typically have higher surface friction than that measured on thicker ones. This behavior was firstly observed epitaxial graphene  and later confirmed to be a universal trait of 2D materials that are weakly adhered to substrates  (Figure 2a). The origin of this unique frictional characteristic was found to be purely mechanical in nature . When 2D materials loosely adhered on substrates are slid by a tip in a friction measurement, these atomically-thin sheets may pucker up and snap to the tip due to the strong tip-sample adhesion. In this case, a thicker sample with a higher bending rigidity will have a weaker puckering effect, leading to a smaller contact area and less friction (Figure 2b). Figure 2. (a) Variation of friction with sample thickness for four layer structured 2D materials . (b) The puckering effect confirmed by MD simulations [9, 10]. The thickness-dependent friction was widely observed for various 2D materials under different experimental conditions (e.g. ambient air, dry nitrogen, vacuum) [11, 12]. The puckering behavior was confirmed by molecular dynamics (MD) simulations [10, 13, 14] and it was also believed to be the essential mechanism accounting for the novel friction anisotropy observed on wrinkled graphene  (Figure 3). More discussions about the puckering effect and its implications can be found in the review articles [16-20]. Figure 3. Friction anisotropy observed on wrinkled graphene with its mechanism explained by the puckering effect . In addition to the thickness dependence, friction on 2D materials also exhibits a distinct transient strengthening behavior, where friction grows markedly during initial sliding and then levels off . This transient behavior is more pronounced for thinner samples and diminishes for thicker ones. Using MD simulations, Li et al. were able to reproduce this strengthening effect and a new mechanism was revealed by examining the detailed evolution of interfacial forces. Essentially, they found that friction on 2D materials was governed by two key mechanisms: the local pinning of the interfacial atoms, and the global commensurability of the tip-sample contact interface (in other words, to what degree the interfacial pinning forces are acting in concert). Both mechanisms are very sensitive to in-plane relaxation of the 2D materials and they can evolve while sliding proceeds (Figure 4). It has long been conjectured, with substantial experimental and theoretical support, that the “true contact area” between two contacting bodies – the “quantity” of atoms in contact – controls friction [22-26]. However, the evolving friction of 2D materials indicates that not only the quantity of true contact area, but also the “quality” (e.g., features like local pinning state and overall commensurability), also control friction. This will be particularly important when we consider frictional behavior of configurationally flexible interfaces. As the flexibility of a thin sheet can be controlled by adjusting its tension, the new mechanism also suggests a means of controlling friction of 2D materials via strain engineering. From early friction study by Leonardo da Vinci to recent nanoscale experiments, friction almost always increases with increasing normal load. However, on a chemically-modified graphite surface, whose top atomic layer of graphene was made very sticky, friction was found to increase abnormally when the normal load was reduced, corresponding to an effective negative friction coefficient  (Figure 5a). Figure 5. (a) Abnormal friction behavior observed on chemically modified graphite . (b) Both interfacial energy and bulk strain energy contribute to the energy corrugation associated with lateral sliding. (c) MD simulations predict that the bulk strain energy may dominate energy corrugation leading to abnormal frictional behavior. This peculiar response can be understood by regarding friction as a configurational force of the tip-graphite sliding system. Considering a tip touching and compressing a substrate surface under an external load, the free energy of the system consists of the strain energy associated with the material deformation, the interfacial adhesion energy and the potential energy of the external load. As the tip slides, the free energy of the system varies as the location of the tip changes. This lateral variation of free energy is known as energy corrugation in tribology and is the cause of friction from energetic point of view . To slide the tip, a lateral driving force is needed to overcome the interfacial energy barrier as well as to push the deformed contact configuration forward  (Figure 5b). In typical cases, when normal load reduces, both interfacial energy barrier and bulk deformation energy reduce, resulting in a weaker energy corrugation thereby smaller friction. However, on a chemically-modified graphite surface, the top graphene layer is sticky enough such that it locally delaminates from the substrate upon contact with the tip. In such scenario, when the tip slides, a lateral force is required to push the contact configuration (containing a donut-shaped internal crack) forward in addition to the interfacial slip resistance. This unique deformation configuration results in an abnormal increase in energy corrugation and friction when the tip retracts from the substrate. Similar abnormal behavior was also observed for multi-layer graphene systems, where the competition between interfacial slip and deformation underneath became crucial . In this sense, friction is not merely an interfacial phenomenon as we had thought before: deformation inside the bulk also matters. As mentioned earlier, 2D materials are atomically-thin and their properties are easily affected by neighboring materials. A rational way of exploiting this feature is to stack 2D materials on top of each other or on other crystalline surfaces to form heterostructures . In such composite systems, moiré superlattice structures are often produced if the upper and lower stacking materials have different lattice parameters or crystalline orientations [31, 32]. Recent experiments and first-principles calculations indicate that these moiré superlattice structures not only exist “visually” but also cause surface buckling and local straining . Friction on these undulated surfaces is generally complicated and often accompanied by notable periodic modulation coinciding with the superlattice structures [33-35] (Figure 6). 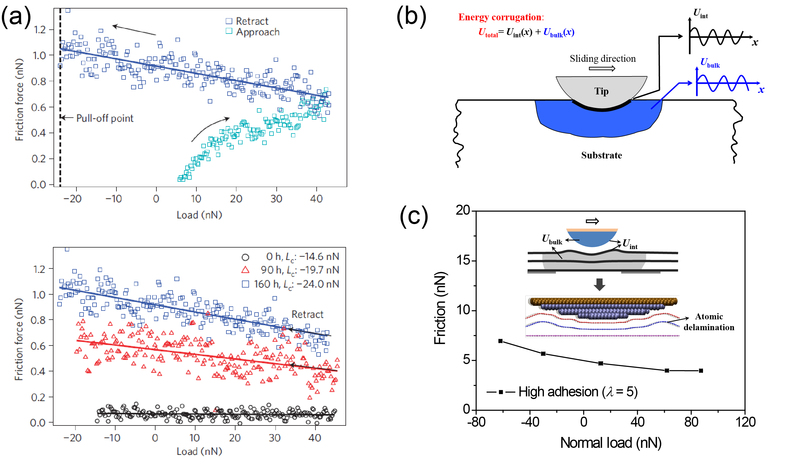 More recently, we experimentally observed an unusual power law dependence of friction on sliding velocity, which is completely different from the traditional frictional behavior on bulk materials. Although the friction modulation can be partially attributed to height variation of the superlattice structures [34, 35], the mechanism for the unusual velocity dependence was still unclear. A systematic study is needed to fully understand the friction process and the energy dissipation mechanism involving periodically confined 2D materials. Figure 6. (a) Schematics showing the formation of moiré superlattice structures. (b) First-principles calculations suggest strong interactions across the heterointerface leading to bulking of the 2D material . (c), (d), (e) Friction modulation on moiré superlattice structures [33, 34]. Although friction is a historically old subject, our understanding about this daily phenomenon is far from complete. 2D materials with their unique and simple topological structures provide a wonderland for exploring the rich physics of friction. In the above discussions, I have shown a few examples where the ultra-high flexibility and the complex deformation modes of 2D materials play an important role in dictating the frictional behavior of on these atomically thin sheets. I believe there must be more interesting examples where mechanics contributes substantially to the understanding of friction and other properties of 2D materials. We are looking forward to your stories or comments. 1. Novoselov, K. S. et al. Two-dimensional atomic crystals. Proc. Natl. Acad. Sci. U. S. A. 102, 10451-10453 (2005). 2. Geim, A. K. & Novoselov, K. S. The rise of graphene. Nat. Mater. 6, 183-191 (2007). 3. Geim, A. K. Graphene: Status and Prospects. Science 324, 1530-1534 (2009). 4. Berman, D., Erdemir, A. & Sumant, A. V. Graphene: a new emerging lubricant. Mater Today 17, 31-42 (2014). 5. Cao, C. H., Sun, Y. & Filleter, T. Characterizing mechanical behavior of atomically thin films: A review. J. Mater. Res. 29, 338-347 (2014). 6. Lee, C., Wei, X. D., Kysar, J. W. & Hone, J. Measurement of the elastic properties and intrinsic strength of monolayer graphene. Science 321, 385-388, doi:10.1126/science.1157996 (2008). 7. Akinwande, D. et al. A review on mechanics and mechanical properties of 2D materials-Graphene and beyond. Extreme Mechanics Letters 13, 42-77 (2017). 8. Filleter, T. et al. Friction and Dissipation in Epitaxial Graphene Films. Phys. Rev. Lett. 102, 086102 (2009). 9. Lee, C. et al. Frictional Characteristics of Atomically Thin Sheets. Science 328, 76-80 (2010). 10. Ye, Z. J., Tang, C., Dong, Y. L. & Martini, A. Role of wrinkle height in friction variation with number of graphene layers. J. Appl. Phys. 112 (2012). 11. Deng, Z. et al. Nanoscale Interfacial Friction and Adhesion on Supported versus Suspended Monolayer and Multilayer Graphene. Langmuir 29, 235-243 (2013). 12. Paolicelli, G., Tripathi, M., Corradini, V., Candini, A. & Valeri, S. Nanoscale frictional behavior of graphene on SiO2 and Ni(111) substrates. Nanotechnology 26 (2015). 13. Mohammadi, H. & Muser, M. H. Friction of Wrinkles. Phys. Rev. Lett. 105, 4 (2010). 14. Ye, Z. & Martini, A. Atomistic Simulation of the Load Dependence of Nanoscale Friction on Suspended and Supported Graphene. Langmuir 30, 14707-14711 (2014). 15. Choi, J. S. et al. Friction Anisotropy-Driven Domain Imaging on Exfoliated Monolayer Graphene. Science 333, 607-610 (2011). 16. Krim, J. Friction and energy dissipation mechanisms in adsorbed molecules and molecularly thin films. Advances in Physics 61, 155-323 (2012). 17. Penkov, O., Kim, H.-J., Kim, H.-J. & Kim, D.-E. Tribology of Graphene: A Review. International Journal of Precision Engineering and Manufacturing 15, 577-585 (2014). 18. Spear, J. C., Ewers, B. W. & Batteas, J. D. 2D-nanomaterials for controlling friction and wear at interfaces. Nano Today 10, 301-314 (2015). 19. Guo, W. L. et al. Friction of low-dimensional nanomaterial systems. Friction 2, 209-225 (2014). 20. Krylov, S. Y. & Frenken, J. W. M. The physics of atomic-scale friction: Basic considerations and open questions. Phys. Status Solidi B-Basic Solid State Phys. 251, 711-736 (2014). 21. Li, S. Z. et al. The evolving quality of frictional contact with graphene. Nature 539, 541-545 (2016). 22. Bowden, F. P. & Tabor, D. The friction and lubrication of solids. Vol. 2 (Clarendon, 1958). 23. Carpick, R. W. & Salmeron, M. Scratching the surface: Fundamental investigations of tribology with atomic force microscopy. Chem. Rev. 97, 1163-1194 (1997). 24. Gnecco, E., Bennewitz, R., Gyalog, T. & Meyer, E. Friction experiments on the nanometre scale. J. Phys.-Condes. Matter 13, R619-R642 (2001). 25. Szlufarska, I., Chandross, M. & Carpick, R. W. Recent advances in single-asperity nanotribology. J. Phys. D-Appl. Phys. 41, 123001 (2008). 26. Mo, Y. F., Turner, K. T. & Szlufarska, I. Friction laws at the nanoscale. Nature 457, 1116-1119 (2009). 27. Deng, Z., Smolyanitsky, A., Li, Q. Y., Feng, X. Q. & Cannara, R. J. Adhesion-dependent negative friction coefficient on chemically modified graphite at the nanoscale. Nat. Mater. 11, 1032-1037 (2012). 28. Sun, X. Y., Qi, Y. Z., Ouyang, W. G., Feng, X. Q. & Li, Q. Y. Energy corrugation in atomic-scale friction on graphite revisited by molecular dynamics simulations. Acta Mech. Sin. 32, 604-610 (2016). 29. Mate, C. M. Tribology on the Small Scale: A Bottom Up Approach to Friction, Lubrication, and Wear. (Oxford University Press, 2008). 30. Geim, A. K. & Grigorieva, I. V. Van der Waals heterostructures. Nature 499, 419-425 (2013). 31. Woods, C. R. et al. 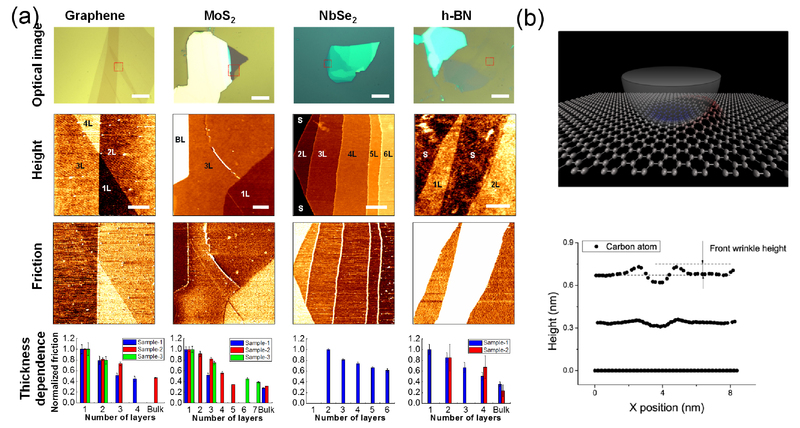 Commensurate-incommensurate transition in graphene on hexagonal boron nitride. Nat Phys 10, 451-456 (2014). 32. 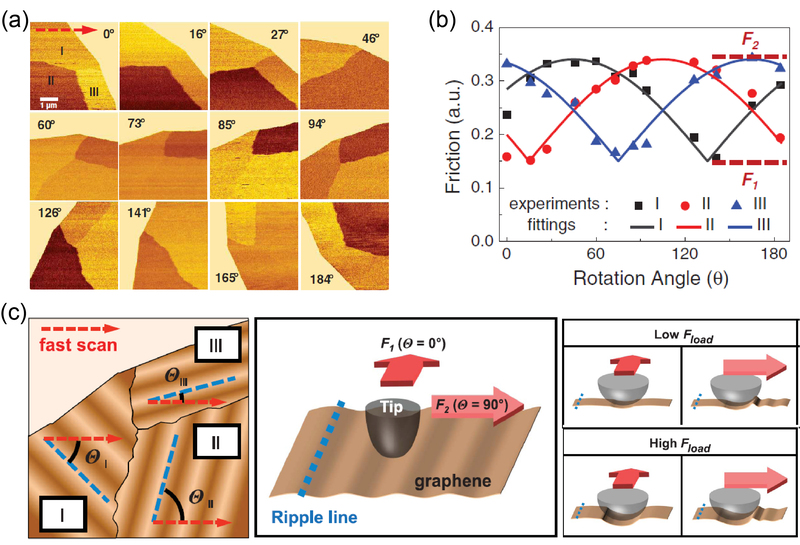 Smirman, M., Taha, D., Singh, A. K., Huang, Z.-F. & Elder, K. R. Influence of misorientation on graphene Moire patterns. Phys. Rev. B 95, 085407 (2017). 33. Zheng, X. et al. Robust ultra-low-friction state of graphene via moiré superlattice confinement. Nature communications 7, 13204 (2016). 34. Liu, J. et al. 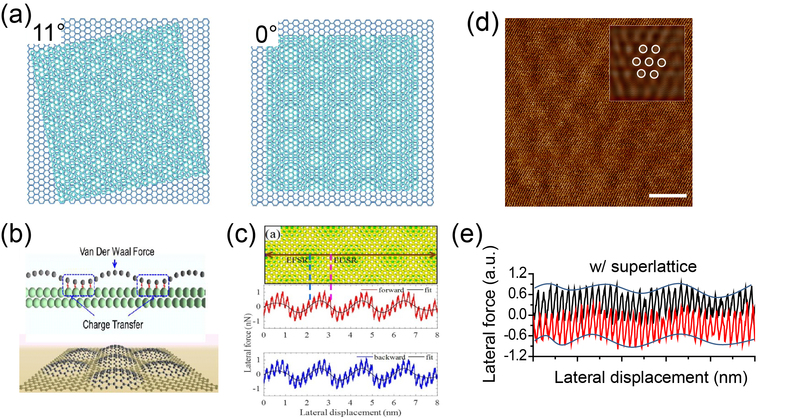 Lateral force modulation by moire superlattice structure: Surfing on periodically undulated graphene sheets. Carbon 125, 76-83 (2017). 35. Shi, R. Y. et al. Moire superlattice-level stick-slip instability originated from geometrically corrugated graphene on a strongly interacting substrate. 2d Materials 4 (2017). Permalink Submitted by Mike Ciavarella on Mon, 2018-04-02 13:54. 1) you mention a type of energy balance for a tip sliding on a single layer -- has this energetic approach been written precisely, or is it just a qualitative balance? 2) what are the applications you think are worth pursuing? With such increased friction, this is detrimental to applications? I understand most of these papers explore the "fundamentals", but what about applications? How to solve high stickiness and high friction if this is required? Permalink Submitted by Qunyang Li on Mon, 2018-04-02 22:40. Thanks for your kind comments. Here are my personal thoughts to the questions you raised. 1) Energetic argument has been widely used to help describe the atomic-scale friction process [See the book by Mate as Ref-29]. For example, one can use the one-dimensional Prandtl-Tomlinson model (i.e. a particle sliding along a peridoc energy landscape) to predict the atomic stick-slip friction behavior, including the shape and magnitue of the of energy corrugation[36-37], the thermal and velocity dependence[38-42]. In most cases, the energy corrugation was regarded as an effective energy landscape experienced by the sliding tip due to tip-substrate surface interaction. However, in some cases involving 2D materials, we showed that this energy landscape was not only determined by the tip-surface sliding interface alone, but also the deformation configuration inside the bulk materials [e.g. Refs-27, 28]. 2) This is a good question. How to use 2D materials in real applications needs to be answered by the society not by myself :) However, from tribological applications, the frictional properties of these 2D materials are quite attractive. Even though they may exhibit the thickness-dependent friction and monolayer samples are more frictional than thick samples, overall friction of these 2D layer structured materials are very low. For exmaple, covering a SiO2 surface (or Cu surface) with a monolayer graphene, friction can be reduced more than 50 times compared to the bare SiO2 or Cu surfaces [43-44]. More potential applications in tirbology can be found in the review article . But I have to pointed out that, depsite the high potential of these atomically thin lubricants, there are some challenging issues to be addressed before they can be fully implemented. 36. Socoliuc, A., Bennewitz, R., Gnecco, E. & Meyer, E. Transition from stick-slip to continuous sliding in atomic friction: Entering a new regime of ultralow friction. Phys. Rev. Lett. 92, 134301 (2004). 37. Perez, D., Dong, Y. L., Martini, A. & Voter, A. F. Rate theory description of atomic stick-slip friction. Phys. Rev. B 81, 245415 (2010). 38. Gnecco, E. et al. Velocity dependence of atomic friction. Phys. Rev. Lett. 84, 1172-1175 (2000). 39. Li, Q. Y., Dong, Y. L., Perez, D., Martini, A. & Carpick, R. W. Speed Dependence of Atomic Stick-Slip Friction in Optimally Matched Experiments and Molecular Dynamics Simulations. Phys. Rev. Lett. 106, 4, (2011). 40. Sang, Y., Dube, M. & Grant, M. Thermal effects on atomic friction. Phys. Rev. Lett. 87, 174301 (2001). 41. Riedo, E., Gnecco, E., Bennewitz, R., Meyer, E. & Brune, H. Interaction potential and hopping dynamics governing sliding friction. Phys. Rev. Lett. 91 084502 (2003). 42. Krylov, S. Y., Jinesh, K. B., Valk, H., Dienwiebel, M. & Frenken, J. W. M. Thermally induced suppression of friction at the atomic scale. Phys. Rev. E 71, 4 (2005). 43. Huang, Y., Yao, Q., Qi. Y., Cheng, Y., Wang, H., Li, Q. and Meng, Y. Wear evolution of monolayer graphene at the macroscale, Carbon, 115, 600 (2017). 44. Qi, Y., Liu, J., Zhang, J., Dong, Y. and Li, Q. Wear resistance limited by step edge failure: The rise and fall of graphene as an atomically-thin lubricating material, ACS Applied Materials and Interfaces, 9(1), 1099-1106 (2017). Permalink Submitted by Mike Ciavarella on Tue, 2018-04-03 07:58. ...not the discrete atomistic ones. For example, JKR theory is a balance of strain energy, and interface energy (with potential mechanical energy if we have load control), which can be generalized. We can obtain adhesive solutions from adhesionless solutions, provided the contact area has the same shape. However, it may be that these "configurational forces" case violates this approach. Ciavarella, M. (2018). An approximate JKR solution for a general contact, including rough contacts. Journal of the Mechanics and Physics of Solids. Permalink Submitted by Qunyang Li on Wed, 2018-04-04 13:06. Congratualtions on your new JMPS paper. Your approach of handling the adhesive contact of rough surfaces is very elegant. Permalink Submitted by Mike Ciavarella on Sat, 2018-04-07 03:27. Permalink Submitted by Qunyang Li on Mon, 2018-04-09 21:53. Thanks for the clarification. I got your point/concern now. I think the confusion lies in the different meaning of "friction". I think your "friction" means specifically the dissipative force. While my "friction" actually means the lateral force (not necessarily dissipative). For example, in the traditional Prandtl-Tomlinson model, when one drives a particle with a linear spring along an energy landscape, if the energy corrugation is relatively small or the spring constant is relatively high, the particle will slide smoothly along the landscape without any exhibiting any stick-slip instability. In this case, sliding forward and sliding backward will be essentially reversible and no energy will be dissipated. According to your definition, friction will be zero. However, one still needs a lateral force (sometimes positive and sometimes negative) to move the particle forward. What I meant previously was that this lateral force could be predicted by the energetics. I fully agree with you that the friction force (defined from the energy dissipation) cannot be predicted soley from energetics. At the continuum level, friction defined from energy dissipation seems to be more relevent. At the atomic scale (or nanotribology you mentioned), people are interested in both lateral force and mean friction (this will have the same meaning as the dissipative force). However, in many cases, when people think about the sliding process in nanotribology, they often focus more on variation of the lateral force while assuming that the system is always overdamped. Maybe, such types of work made you feel that they were too idealized and not physically meaningful :) I agree with you that once a particle overcomes an energy barrier and starts to slip, its energy is not necessarily fully damped when it reaches the next energy barrier. How energy dissipates during this slip process is a fundamental question, which essentially determines the level of dissipative friction. Nowadays, it is believed that the energy is dissipated primarily through lattice vibrations (phonon and eventually heat) and sometimes electronic excitations[45-48]. Of courses, these two mechanisms are for elastic and wearless sliding. For macroscale sliding process, more dissispative mechanisms can be involved, e.g., plastic deformation, crack or new surfaces, capillary ruptures.... All these make friction at the larger scales very complicated. 45. Witte, G. et al. Damping of molecular motion on a solid substrate: Evidence for electron-hole pair creation. Phys. Rev. Lett. 80, 121-124, doi:DOI 10.1103/PhysRevLett.80.121 (1998). 46. Park, J. Y., Ogletree, D. F., Thiel, P. A. & Salmeron, M. Electronic control of friction in silicon pn junctions. Science 313, 186-186, doi:10.1126/science.1125017 (2006). 47. Qi, Y., Park, J. Y., Hendriksen, B. L. M., Ogletree, D. F. & Salmeron, M. Electronic contribution to friction on GaAs: An atomic force microscope study. Phys. Rev. B 77, 184105 (2008). 48. Kisiel, M. et al. Suppression of electronic friction on Nb films in the superconducting state. Nat Mater 10, 119-122 (2011). Permalink Submitted by Yanfei Gao on Mon, 2018-04-02 19:55. Very fantastic works! I always enjoy reading your nice works that combine experiments/modeling/simulation. Permalink Submitted by Qunyang Li on Mon, 2018-04-02 23:12. Thanks for kind words and sharing the two inspiring papers. Structural lubricity and thermal lubricity are two interesting and important phenomena in friction, which might lead to revolutionary applications if properly controlled. I fully agree with you that the collective behavior exhibited by the flexibile graphene interface shares the same physical origin as the structural lubricity you mentioned. Interface commensurability is an important variable of the contact state. Recently, we have experimentally demonstrated that it indeeds can be actively tuned by straining the system. We will keep posted for this. Regarding the thermal effect, most availabe theories adopt the approach of thermal activation. This usually leads to a logarithmic dependence on sliding velocity. However, our recent experiments show an unsual power law dependence for friction on moire superlattice structure. Do you happen to have any thoughts on this abnormal behavior? Permalink Submitted by Shuze Zhu on Tue, 2018-04-03 03:08. Thanks for putting together such a fantastic review! Indeed, the deformation of the interface matters to the abnormal load dependence. Here I am adding a reference to the abnormal load dependence of friction in lamellar materials, in which we studied the effects of surface compliance and relaxation on the changing of contact area upon indenting and retracting the tip. Permalink Submitted by Qunyang Li on Wed, 2018-04-04 12:57. Thanks for sharing the very relevant paper. The simualtion results presented in your work nicely showed that the interlayer deformation between the top-layer graphene and bottom-layer graphene made a significant contribution to the frictional resistance, or the configurational force as I mentioned. So these atomically-thin lamellar materials indeed behave distinctively from bulk materials upon adhesive contact. Permalink Submitted by Zhaohe Dai on Thu, 2018-04-05 15:14. Thanks for sharing this very interesting review. These tip-based friction characterizations are very attractive. Many important properties (e.g. electronic performance) of 2D material-based devices can be tuned by simply deforming/sliding/twisting the interface formed by the 2D material to its substrate and by 2D materials themselves. Permalink Submitted by Qunyang Li on Mon, 2018-04-09 12:30. Thanks for sharing the interesting and nice work. Interlayer sliding between 2d materials and their contacting surfaces is another hot topic in tribology. Depending on the atomic stacking and the nature of the inter-molecular forces, the frictional behavior can be very intriguing. For example, friction tuning via modifying the chemistry of the substrate surface as shown in your papers, or suppressing friction to acheive so-called superlubricity (nearly a frictionless state) via adjusting interface stacking as partially shown in your PRL paper.